You’re Invited to South Miami Art Fest! 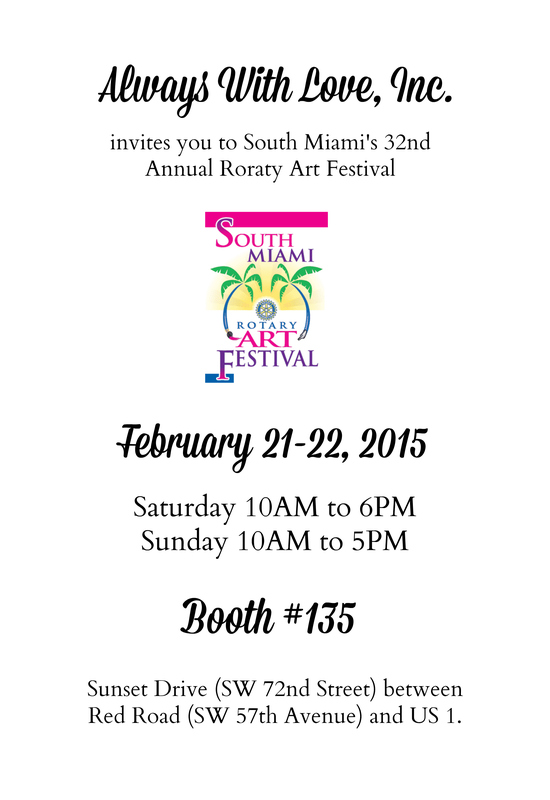 If you are in South Florida you can’t miss out on South Miami’s 32nd Annual Rotary Art Fest! Visit me at booth #135 to find your Always With Love favorites and for the unveiling of my new designs! This is a juried show and I’m very excited I was picked to participate. The festival is located in the heart of downtown South Miami, adjacent to the Shops at Sunset Place. It is held on Sunset Drive (SW 72nd Street) between Red Road (SW 57th Avenue) and US 1. February 21-22, 2015, Saturday 10:00 AM – 6:00 PM and Sunday 10:00 AM – 5:00 PM. On Saturday night there is live jazz onstage until 8:00 PM in the beer garden at 58th Avenue and Sunset.